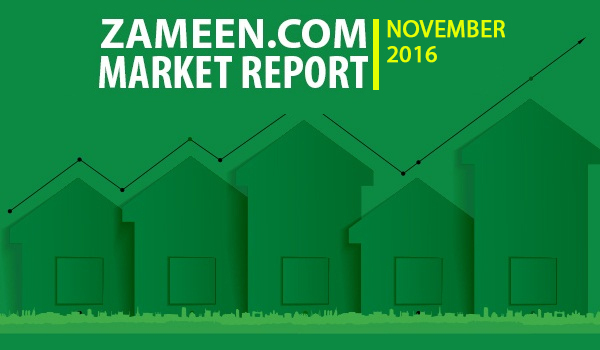 According to the property price data maintained by Zameen.com, property prices in almost all major localities in Lahore, Islamabad, Karachi, and Gujranwala showed stability in November – with only a few exceptions here and there. Prices in some localities also registered moderate growth, probably hinting at absorption of the new laws by the market, at least to some degree. 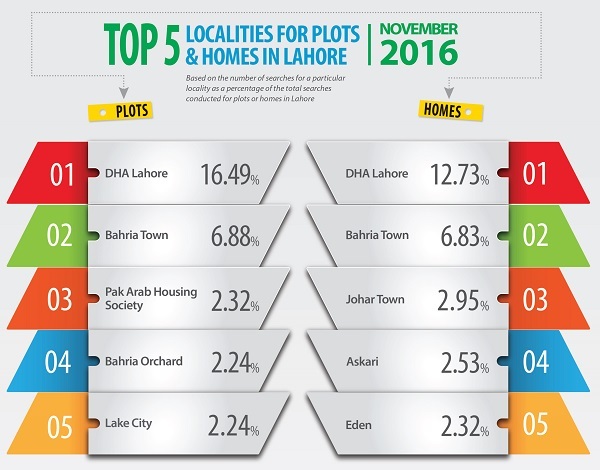 In Lahore’s real estate landscape, DHA Lahore failed to impress investors during the month of November, as prices in all investor-centric phases dropped moderately. 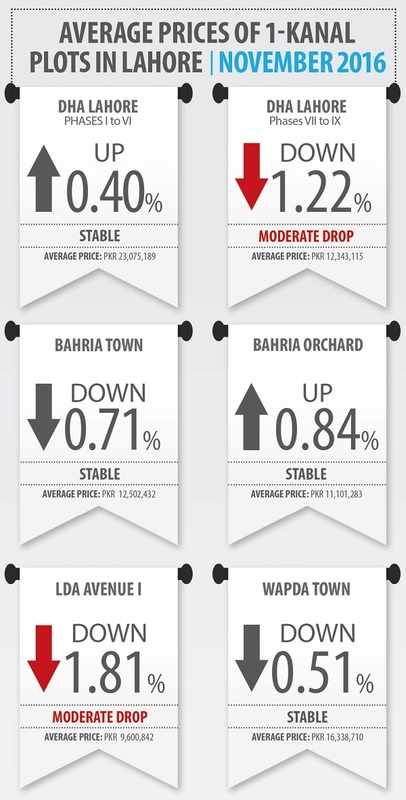 LDA Avenue I, on the other hand, also registered downward trends in average property prices. Stability was the evident trend in all other localities in the provincial capital. 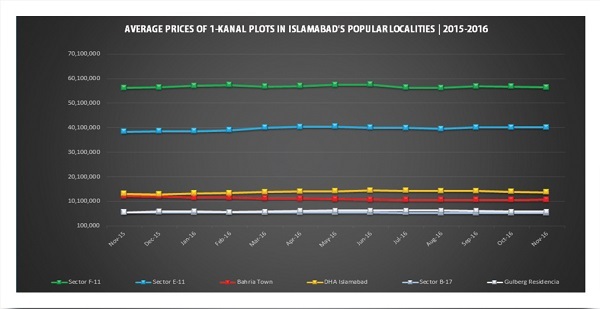 This time around, Islamabad’s property sector witnessed one anomaly: average prices of 10-marla and 1-kanal residential plots in Bahria Town registered moderate growth. 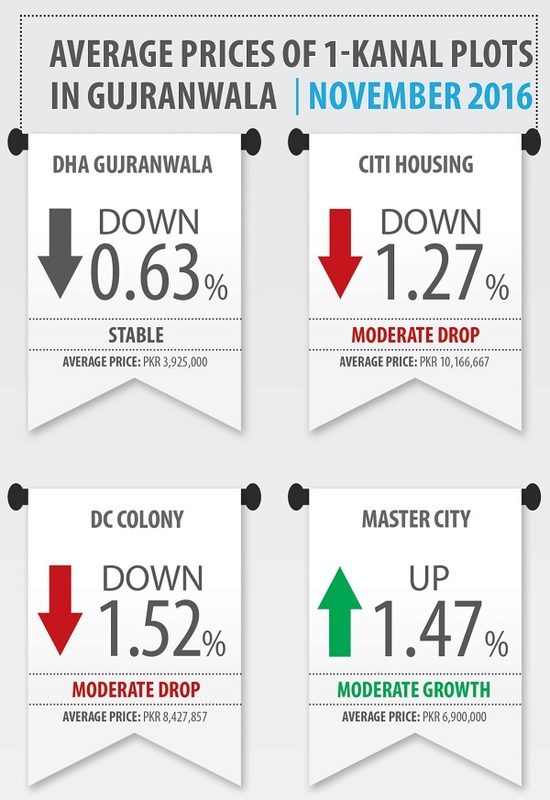 Property prices in other societies in the federal capital remained stable and no jarring numbers were seen during the month. 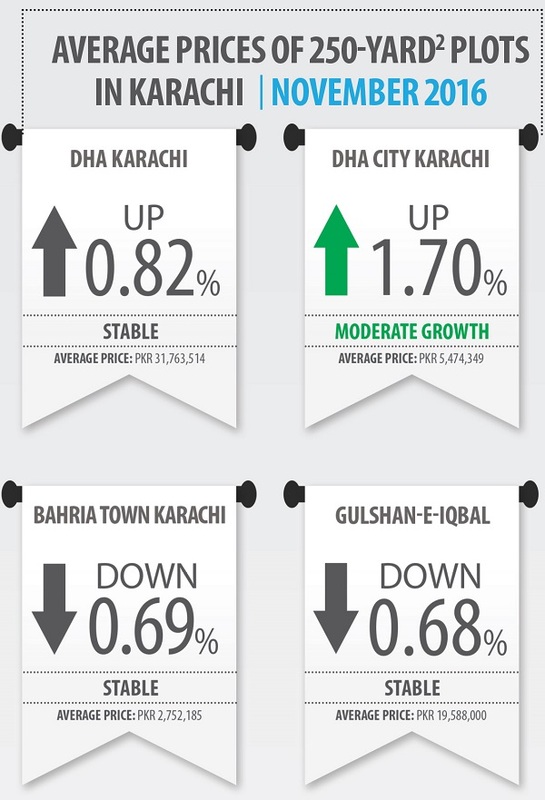 The performance of Karachi’s realty sector improved marginally in November, as DHA Karachi and DHA City Karachi (DCK) saw an upward movement in sale-purchase activity. Bahria Town Karachi (BTK) and Gulshan-e-Iqbal clung on to stability. Gujranwala’s realty scene was certainly no different. Master City was the only locality where prices increased moderately, while all other societies including DHA Gujranwala sailed through the month exhibiting less-than impressive numbers. 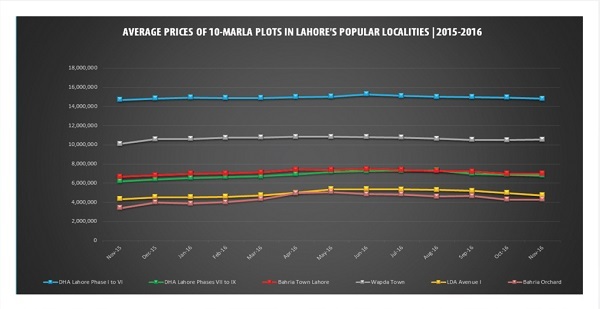 Property investors in Lahore have probably not gotten over the new tax regime and are not familiar with the recently announced amnesty scheme, leading them to shun even DHA Lahore’s Phases VII to IX, where prices of both 1-kanal and 10 -marla plots dropped 1.22% and 1.35% respectively. 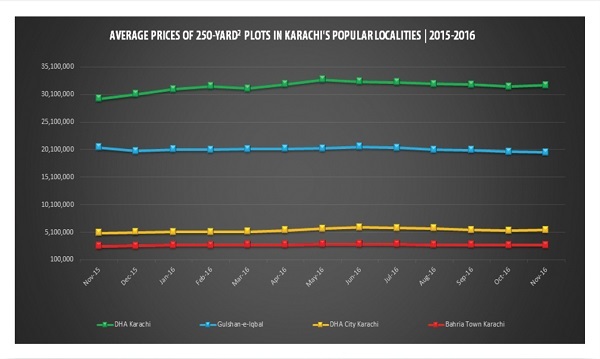 Though property owners are willing to sell in Bahria Town, because of the unavailability of buyers, sale-purchase activity in the locality was not alive and kicking in November. 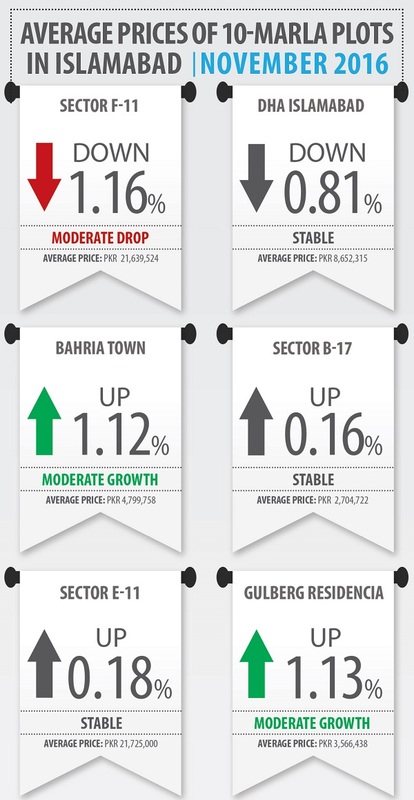 As a result, property prices remained stable in Bahria Town. 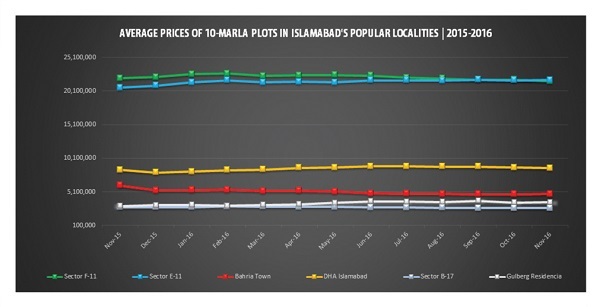 In LDA Avenue I, matters were worse as prices of 10-marla and 1-kanal plots in the locality declined 4.82% and 1.81% in that order. 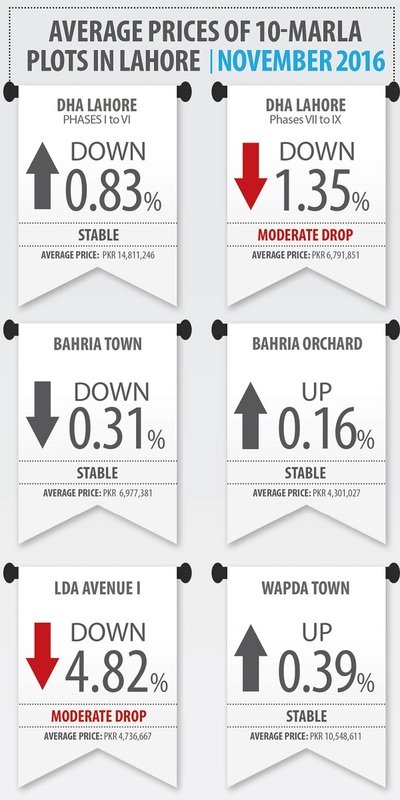 While the prices of properties in Bahria Orchard and Wapda Town remained stable over the course of one month, genuine buyers steered most of the activity in these localities. 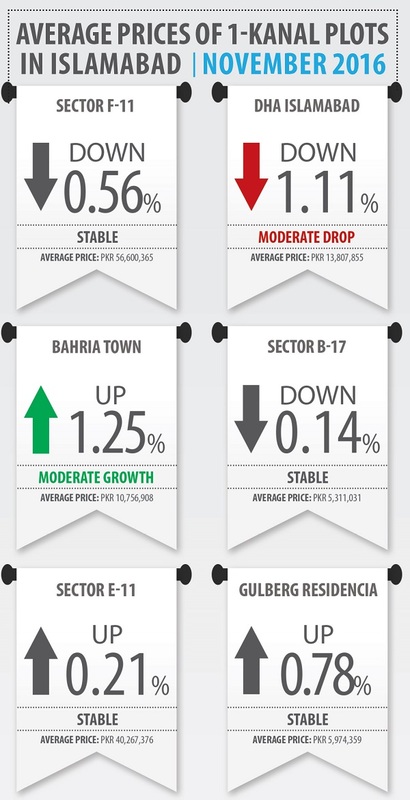 As mentioned in the overview, Bahria Town kept strong in the month of November. 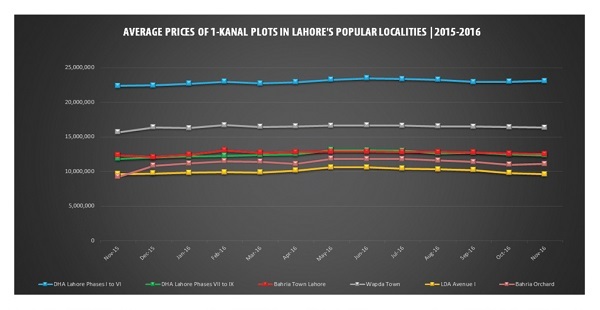 According to Zameen.com’s statistics, prices of 10-marla and 1-kanal plots in the locality increased 1.12 and 1.25% respectively. 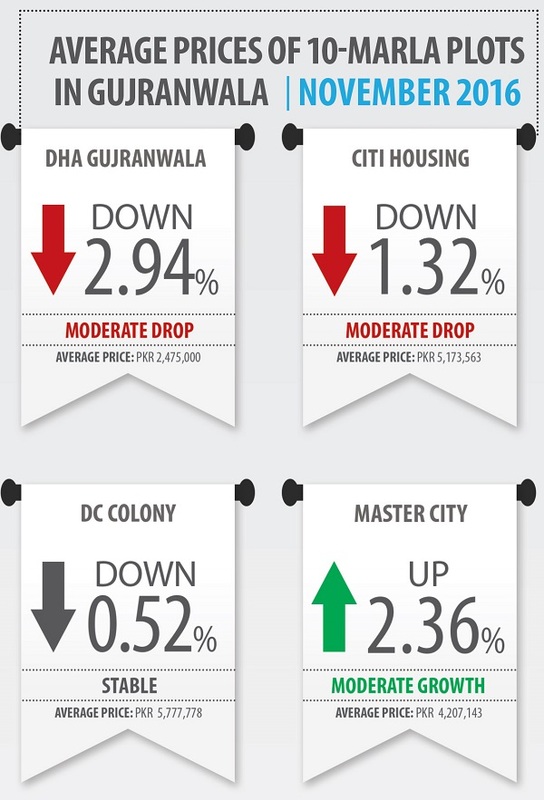 In October, Gulberg Residencia had registered sharp downward trends in property values. However, in November, the locality picked up some steam and exhibited stability in property prices. 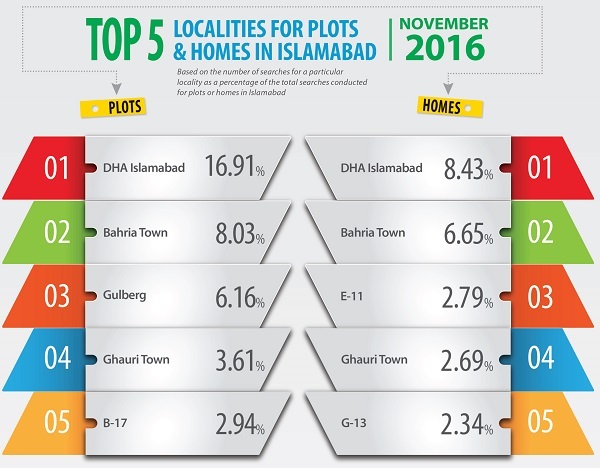 DHA Islamabad failed to impress investors during the month, as the average price of 1-kanal plots in the locality dropped 1.11%. Amid stable property prices and no impressive sale-purchase activity, Sector B-17, Sector E-11 and Sector F-11 did not breathe much during the month. 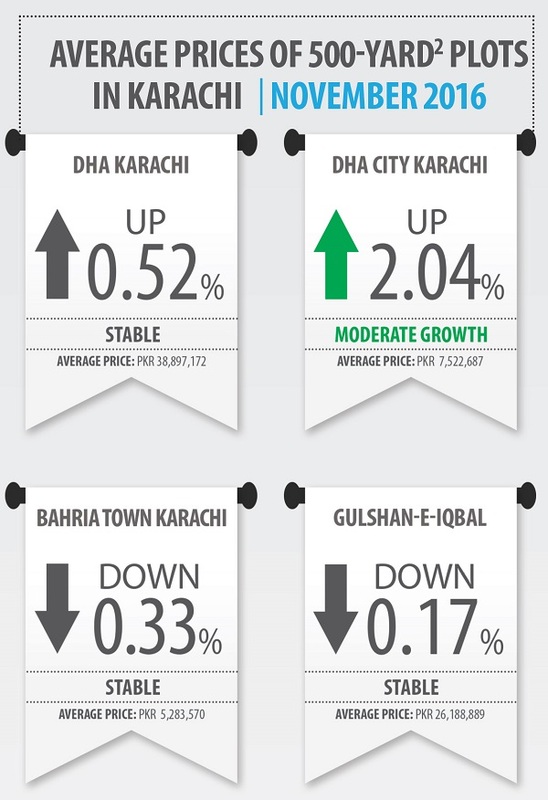 The real estate market of Karachi showed some signs of improvement in November. 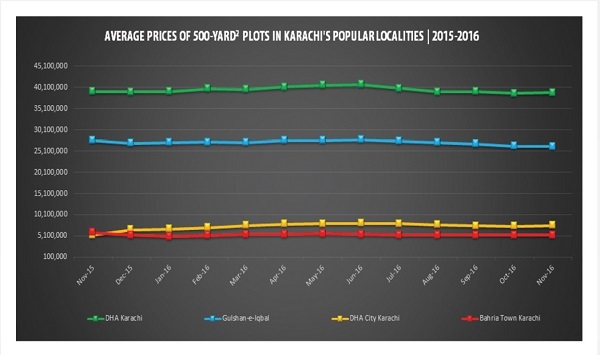 Property prices in DHA Karachi remained stable, while in DCK, the average value of 1-kanal and 10-marla plots increased by 2.04% and 1.70% respectively. Sale-purchase activity also slightly picked up pace in these localities in November. 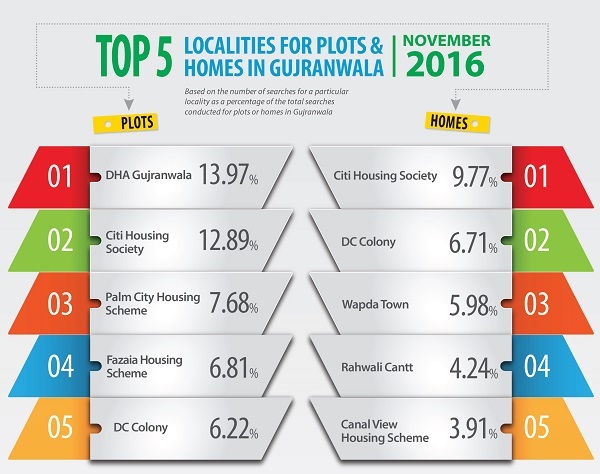 Over the course of November, BTK and Gulshan-e-Iqbal registered stability in property values because of the absence of a good number of buyers. However, with the recent announcement of the amnesty scheme, activity may pick up pace in these localities in the months to come. 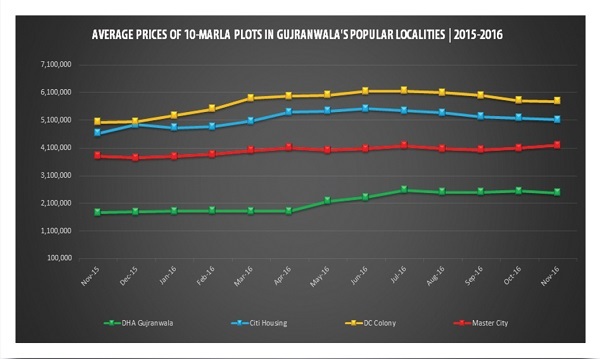 Prices of 10-marla and 1-kanal plot files in DHA Gujranwala increased moderately in the month of October, but the locality failed to keep up the same trend in November and the average price of 10-marla plot files in the locality recorded a drop of 2.94%. Master City has been performing exceptionally well since its inception. 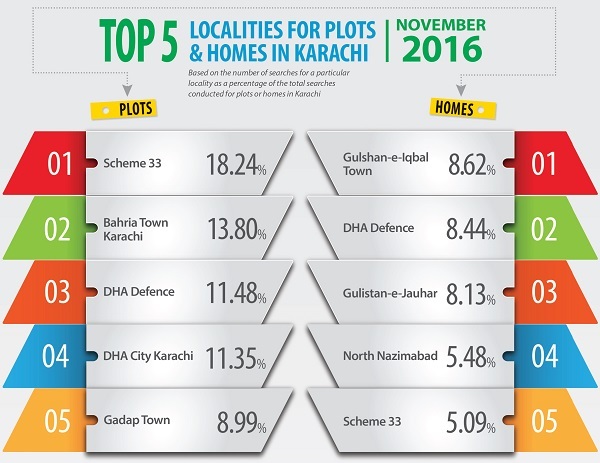 Even in November, moderate growth of 1.47% and 2.36% was seen for 1-kanal and 10-marla plots respectively in the locality. Furthermore, development work is being carried out at a good pace here. On the other hand, prices of the same category plots in DC Colony and Citi Housing dropped during the month. The real estate sector of Pakistan has been dismally slow since the implementation of the new tax regime, causing property prices to drop in all major societies across the country. However, sale-purchase activity improved marginally in the month of November. The government has also approved an amnesty scheme for the property sector, but its results are not yet apparent. While some investors are hesitant to avail this scheme, others are unaware of the procedure that needs to be followed to benefit from the scheme, or don’t understand it fully in many cases. “The government should address investors’ concerns about the amnesty scheme. Otherwise, not many people would be willing to avail it,” said Zameen.com CEO Zeeshan Ali Khan. “Property market has shown some positive signs in November. Though the performance of the sector was not above par during the month, we hope the market situation will improve in the months ahead,” he added. By October, the market had become pretty passive, however, a slight increase in activity in November makes us believe that there may be light at the end of the tunnel and all hope is not lost.